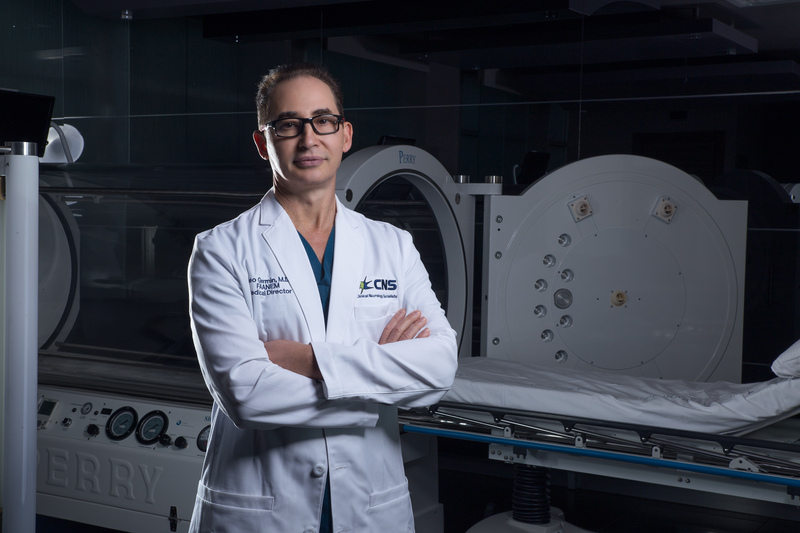 Hyperbaric Oxygen therapy in Chronic Traumatic Brain Injury or Post-Traumatic Stress Disorder. “The Treatment of Acute Crush Injuries and Limb Transplantations with Hyperbaric Oxygen”. Dr. Leo Germin is a trained Hyperbaric Medicine (HBOT) Physician, Board Certified in Neurology, Vascular Neurology and Neuromuscular and Electrodiagnostic Medicine. Dr. Germin has unique and extensive experience after being trained at Center of Hyperbaric Medicine Moscow, USSR in 1985. He practiced at the Lithuanian Republic HBOT and Poison Control Center from 1984-1989, using HBOT treating over 5,000 patients with various indications over these years. Dr. Germin contributed his expertise with presentation of the lecture, “The Treatment of Acute Crash Injuries and Limb Transplantation’s with Hyperbaric Oxygen” at the Sixth USSR Conference on Hyperbaric Oxygenation in 1986. In 1987 by the authority granted by the Government of the USSR, the State Committee of Discoveries and Inventions, Dr. Germin was granted a certificate authorship patent for the invention: ‘Method for determining individual sensitivity to hyperoxic environment under conditions of hyperbaric oxygenation’. Was a member of the Hyperbaric Oxygen Therapy for Persistent Post-Concussive Symptoms after Mild Traumatic Brain Injury (HOPPS) study for US Army Medical Research and Material Command team. Alayna has been a trained NAUI scuba Diver since 1994. She became a Certified Hyperbaric Technologist in 2008. Alayna has worked with many different facilities both military and civilian utilizing both monoplace and multiplace hyperbaric chambers. Alayna is passionate about hyperbaric medicine and would like to see the field advance for a wider range of accepted indications for use. CHT Capo is a full time staff hyperbaric technician. Marina became a Certified Hyperbaric Technologist in 2013. Marina has worked in outpatient hyperbarics and also for a Level I Hyperbaric Facility (24/7). She has worked with a variety of monoplace hyperbaric chambers. CHT Baldwin is a part time staff hyperbaric technician.